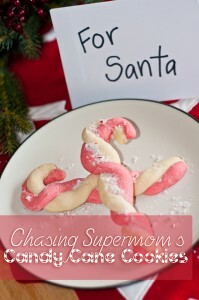 One of my very FAVORITE holiday traditions is doing the 25 Days of Christmas. 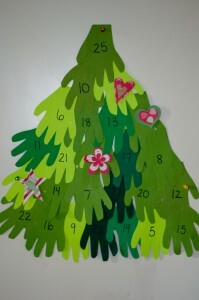 Beginning on December 1st, we make time to do one holiday-themed activity, craft, outing, project, etc. together as a family. 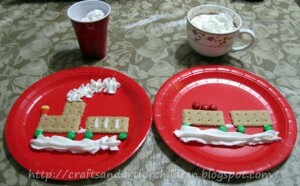 We decorate gingerbread houses, go on our annual Christmas lights drive (in our pj’s! ), and bake holiday goody plates for our friends. The kids never know what the next day’s activity will be, and the added anticipation only adds to the excitement. 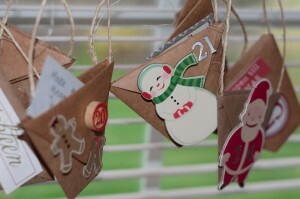 Up until now, we’d been using an old advent calendar I got at Starbucks a few years ago. It’s shaped like a tree and has little pull-out boxes with numbers on them. It worked well and suited our needs……BUT, I’d always wanted something just a bit cuter. I began searching ALL OVER the internet for ideas. I was looking for a project that my mom’s group could make. It had to be cute, and it had to be cost-effective. I finally landed on an idea that I not only loved, but that I knew could work for our group. I found the inspiration HERE. Are you ready to craft your heart out? 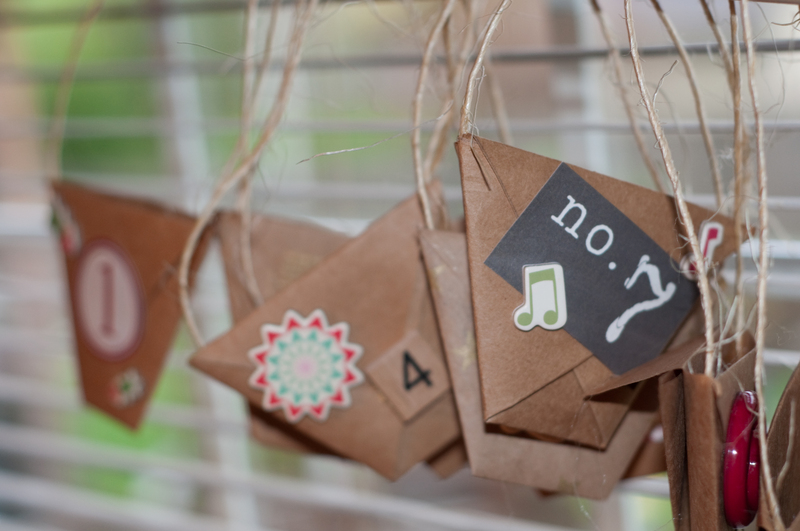 This little project is really fun to make and decorate! 1. Fold your paper. You will need 24 6 inch squares of paper. I used plain brown butcher paper, but you could use just about any paper you wanted. I liked the simplicity of the brown, and liked that it allowed me to have some fun decorating. You want to end up with 24 little folded cups. You’ll slip your activity slips inside the cups when you are finished. 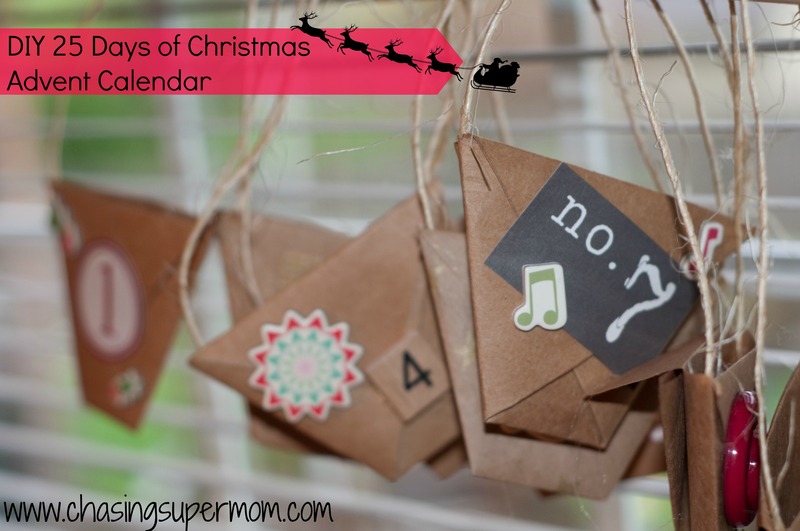 You could also fill your advent calendar with little treats, but I love the notion of an advent calendar based on family-togetherness and the building of holiday memories. So much better than chocolate and peppermints. I am SO not an origami master. (By any stretch!) BUT, if I could fold these (and I folded 500+ of these cups! ), ANYONE can do it! The best tutorial out there can be found HERE. *You may need to use a glue stick and glue down the flaps when you are finished. 2. Gather your decorations! This part was a lot of fun! You’re going to want to find a good selection of things with numbers on them. 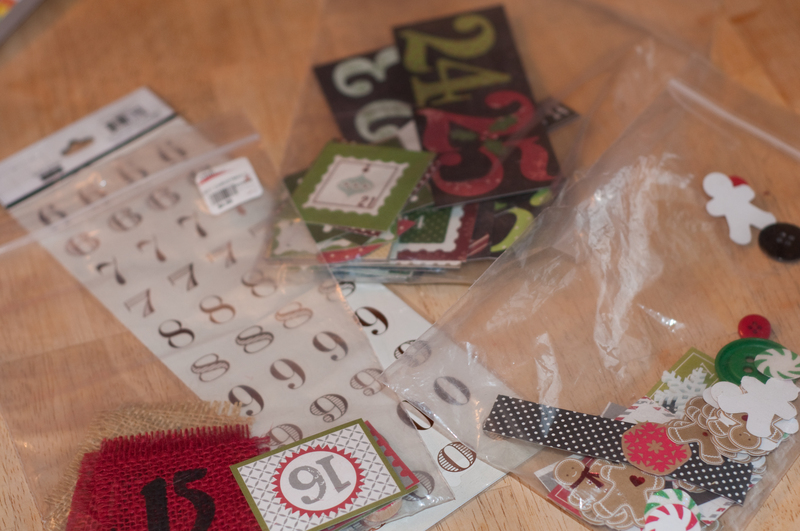 We used a lot of scrapbook number stickers, Christmas scrapbook paper (a TON of it had all the numbers on it, and we just had to cut them out! ), old game pieces, etc. The sky is the limit. I also found other little odds and ends like buttons, burlap (that my Mom stenciled with numbers), holiday chip-board, Christmas stickers, etc. 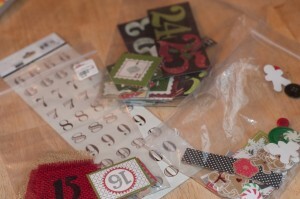 You could also cut apart old Christmas cards or Christmas wrapping paper. Be creative and have fun with it! 4. Decorate! I had so much fun doing this. I laid out all of my choices, and tried to vary my cups, so that the numbers were all different. I glued on all of my “doo-dads” and numbers. I tried to use a good variety of materials, and had fun creating an advent calendar that reflected my personality and style. I strung the cups on a long wooden dowel (totally cheap at the hardware store) and tied ribbon on either end of the dowel to hang this. Each day in December, my kids will get to reach inside that day’s cup and see what our family activity will be. 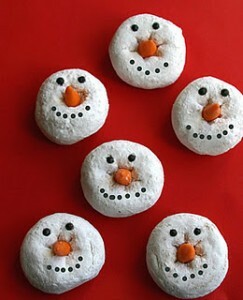 Will it be snowman day? Will we have a b-day party for Jesus? Camp out under the tree? 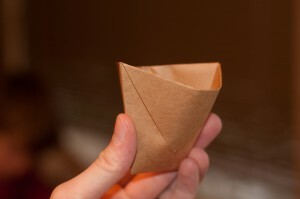 You can check out my list of activities for the cups HERE. Happy crafting, and have a very merry 25 Days of Christmas!! I love this! I was raised Jewish so I never had an Advent calendar, but I love the idea behind it. I really like that your family tries to do one holiday-themed activity together for each day leading up to Christmas – what a great way to encourage spending time together!